Got a tough bag closing task? The Tony H-7-A delivers with ease. 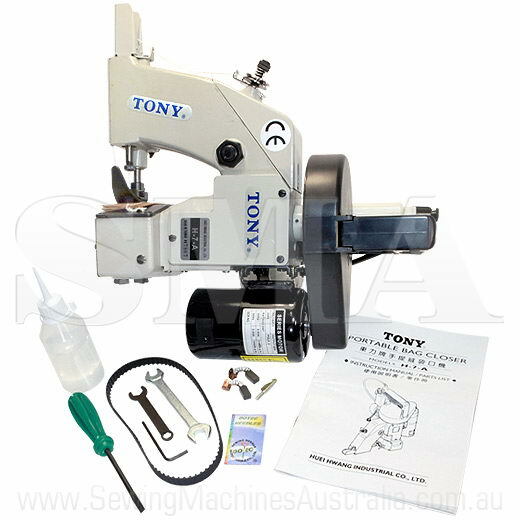 The single thread Tony H-7-A Portable Bag Closer is a medium quality high-speed bag closing machine. The Tony H-7-A has a steel cam, automatic thread cutter and lubrication device and is ideal for closing bags of agricultural products, animal feeds, fertilizer, flour, chemicals and other pelleted and powder materials along with many more products. The Tony H-7-A is such a versatile closer that it also sews on horizontal surfaces and can be used to join two fabrics. The Tony H-7-A closes virtually every type of bag, including kraft paper, cotton, hessian, jute, PP/PE woven cloth as well as other bag materials. Oil lines direct lubricant to main moving elements.